Central Provinces and Berar, 1903. Princely states are shown in yellow. Nagpur is the winter capital of the state of Maharashtra, a fast growing metropolis and third largest city in Maharashtra after Mumbai and Pune. With a population of 46,53,570 (2011) Nagpur Metropolitan Area is the 13th largest urban conglomeration in India. It has also recently been ranked as the cleanest city and the second greenest city of India . In addition to being the seat of annual winter session of Maharashtra state assembly “Vidhan Sabha”, Nagpur is also a major commercial and political center of the Vidarbha region of Maharashtra, and is also famous throughout the country as “Orange City” for being a major trade center of oranges that are cultivated in the region. In addition, the city also derives political importance from being the headquarters for the RSS and an important location for the Buddhist movement. The city was founded by the Gonds but later became part of the Maratha Empire under the Bhonsles. The British East India Company took over Nagpur in the 19th century and made it the capital of the Central Provinces and Berar. After the first reorganisation of states, the city lost its capital status but according to the “Nagpur Pact” between political leaders it was made the second capital of Maharashtra. Nagpur is also called, “Tiger Capital of India ” as it connects many Tiger Reserves in India to the world. It is among the important cities for IT sector in Maharashtra after Pune. Nagpur lies precisely at the center of the country with the Zero Mile Marker indicating the geographical center of India. The Nag River, a tributary of the Kanhan River, flows in a serpentine path and is therefore named “Nag”, the Marathi word for snake. And hence, the river and city is named as Nagpur.. While others says that the river flows through the old city of Nagpur and hence the city is named after this river. “Pur” is a common suffix given to cities, villages and towns across India, and is often simply translated “city” The seal of Nagpur Municipal Corporation depicts a cobra in the water of a river. Human existence around present day Nagpur city can be traced back 3000 years to 8th century BC. Mehir burial sites at Drugdhamna (near Mhada colony) indicate megalithic culture existed around Nagpur and is still followed in present times. The first reference to the name Nagpur is found in a 10th century copper-plate inscription discovered at Devali in the neighbouring Wardha district. The inscription is a record of grant of a village situated in the visaya (district) of Nagpura-Nandivardhana during time of Rastrakuta king Krsna III in the Saka year 862 (940 CE). Towards the end of third century King Vakataka dynasty, Vindhyasakti is known to have ruled the Nagpur region. In the 4th century Vakataka Dynasty ruled over the Nagpur region and surrounding areas and had good relations with the Gupta Empire. The Vakataka king Prithvisena I moved his capital to Nagardhan (ancient name Nandivardhana), located at 28 kilometres (17 mi) from Nagpur. After the Vakatakas, the region came under the rule of the Hindu kingdoms of the Badami Chalukyas, the Rashtrakutas, and finally the Yadavas. In AD 1296 Allauddin Khilji invaded the Yadava Kingdom after capturing Deogiri, after which the Tughlaq Dynasty came to power in 1317. 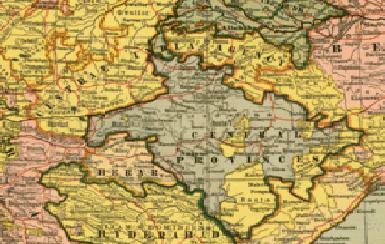 In the 17th century, the Mughal Empire conquered the region. However, regional administration was carried out by the Gond kingdom of Deogarh-Nagpur in the Chhindwara district of the modern-day state of Madhya Pradesh. Recent history ascribes the founding of Nagpur to Bakht Buland, a prince of the kingdom of Deogarh-Nagpur. The next Raja of Deogarh was Chand Sultan, who resided principally in the country below the hills, fixing his capital at Nagpur which he made a walled town. On Chand Sultan’s death in 1739, Wali Shah, an illegitimate son of Bakht Buland, usurped the throne and Chand Sultan’s widow invoked the aid of the Maratha leader Raghuji Bhonsle of Berar in the interest of her sons Akbar Shah and Burhan Shah. The usurper was put to death and the rightful heirs placed on the throne. After 1743, a series of Maratha rulers came to power, starting with Raghoji Bhonsle, who conquered the territories of Deogarh, Chanda and Chhattisgarh by 1751. In 1803 Raghoji II joined the Peshwa against the British in the Second Anglo-Maratha War, but the British prevailed. After Raghoji II’s death in 1816, his son Parsaji was deposed and murdered by Mudhoji II. Despite the fact that he had entered into a treaty with the British in the same year, Mudhoji joined the Peshwa in the Third Anglo-Maratha War in 1817 against the British, but suffered a defeat at Sitabuldi in present-day Nagpur city. The fierce battle was a turning point as it laid the foundations of the downfall of the Bhonsles and paved the way for the British acquisition of Nagpur city. Mudhoji was deposed after a temporary restoration to the throne, after which the British placed Raghoji III the grandchild of Raghoji II, on the throne. During the rule of Raghoji III (which lasted till 1840), the region was administered by a British resident. In 1853, the British took control of Nagpur after Raghoji III died without leaving an heir. From 1853 to 1861, the Nagpur Province (which consisted of the present Nagpur region, Chhindwara, and Chhatisgarh) became part of the Central Provinces and Berar and came under the administration of a commissioner under the British central government, with Nagpur as its capital. Berar was added in 1903. Tata group started the country’s first textile mill at Nagpur, formally known as Central India Spinning and Weaving Company Ltd. The company was popularly known as “Empress Mills” as it was inaugurated on 1 January 1877, the day queen Victoria was proclaimed Empress of India. The Non-cooperation movement was launched in the Nagpur session of 1920. After Indian Independence in 1947, Central Provinces and Berar became a province of India, and in 1950 became the Indian state of Madhya Pradesh, again with Nagpur as its capital. However, when the Indian states were reorganised along the linguistic lines in 1956, Nagpur and Berar regions were transferred to Bombay state, which in 1960 was split between the states of Maharashtra and Gujarat. At a formal public ceremony on 14 October 1956 in Nagpur B. R. Ambedkar along with his supporters converted to Buddhism starting Dalit Buddhist movement which is still active. Nagpur is a city with great capabilities to grow and prosper in the coming days. It is very important for State and Central Governments to contribute to the growth, development, prosperity of Nagpur. Nagpur completed 300 years of establishment in the year 2002. A big celebration was organised to mark the event. 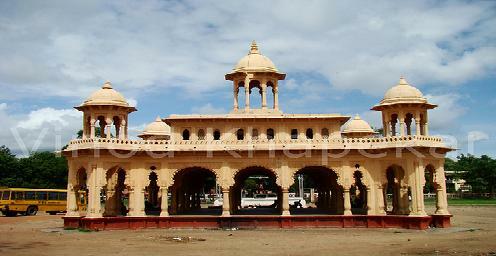 Kalidas Festival is celebrated annually at Ramtek and Nagpur for two days in the month of November. Organized by MTDC in association with the District Collectorate Office of Nagpur, this festival of Music, Dance and Drama is held to honour Kalidasa. Kalidas was a great Sanskrit poet and dramatist of India, renowned for his historical drama Shakuntalam, Kumaarasambhava , Ritusamhaara and for the epic poem Meghdoot alias Meghdootam. It is said the picturesque Ramtek has inspired Kalidas to write his famous literary work, Meghdootam. One of the biggest meeting places in Nagpur city, Kasturchand Park is situated at about 1 km. from central railway station. 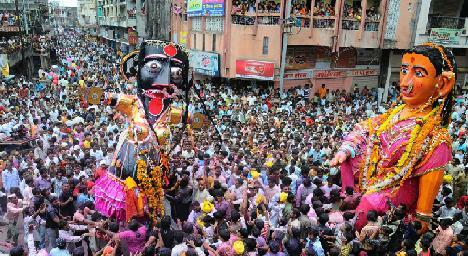 It is the most popular place when it comes to holding big processions in the city. In fact, a lot of trade shows and fairs are also organized in the park owing to the space available here. The park is always thriving with all sorts of activities the entire year. Nagardhan, situated 38 kms northeast of Nagpur and about 9kms south of Ramtek, is an old town founded by a Suryavanshi King. Main attraction of Nagardhan is the Nagardhan Fort, supposed to be built by Raja Raghuji Bhonsle, a maratha king of the Bhonsale dynasty. The square shaped palace inside the fort has an outer rampart with bastions and had an inner wall surrounding the buildings. 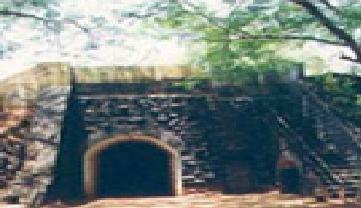 The main gate of the fort on the north-west side is still in good condition. Sitabuldi Fort in Nagpur Sitabuldi fort, site of the 1817 Battle of Sitabuldi, is located atop a small hillock in the middle of Nagpur. 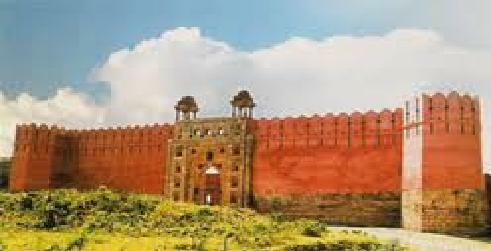 The fort was built by Appa Sahib or Mudhoji II Bhonsle of the Kingdom of Nagpur, just before he fought against the British East India Company during the Third Anglo-Maratha War. The area surrounding the hillock is now known as Sitabuldi and is an important commercial hub for Nagpur. Zero Mile in Nagpur Nagpur lies precisely at the center of the country with the Zero Mile Marker indicating the geographical center of India. The Zero Mile Stone was erected by the British who used this point to measure all the distances. The Zero Mile Stone consists of four horses and a pillar made up of sandstone. 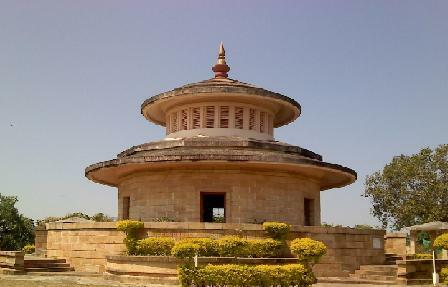 It is located on the south east of Vidhan Bhavan, Nagpur. Marbat Festival held especially in the Nagpur city, is an important festival in this region which is celebrated to protect the city from evil spirits. During the festival, people of Nagpur venerate their God to save them from the evil spirits and they make statues of evil forces. 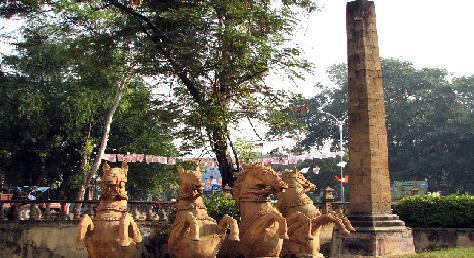 These statues are taken to a vast ground as a procession, from all the areas of the city. They are burnt together on a belief that the city would be free from all types of evils. People purchase and wear new attires and ornaments on that day and women prepare delicious delicacies and distribute to everyone. Various cultural activities such as dance, drama etc are also organized during the festival.